Merry Christmas! Nothing says Christmas morning like a tasty baked good. 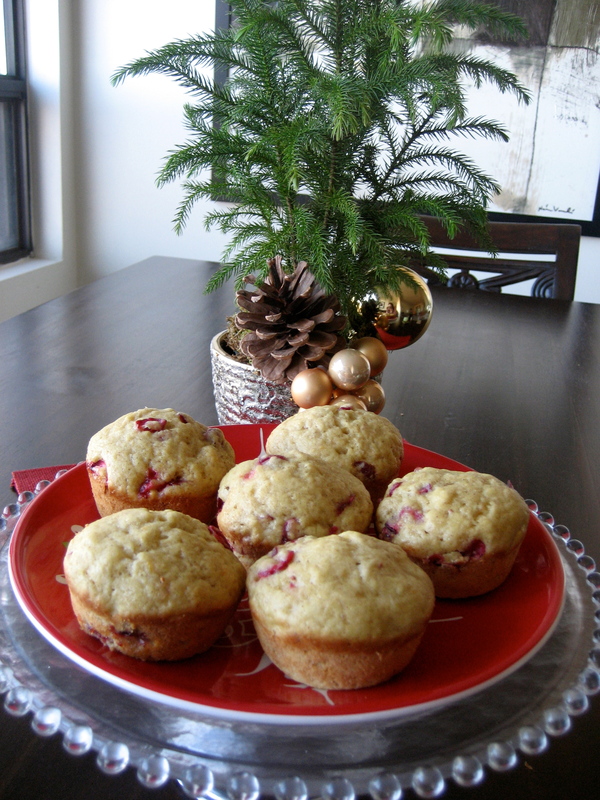 When I saw the title of this recipe I knew I had to try it, especially because I have been on a cranberry kick these days. 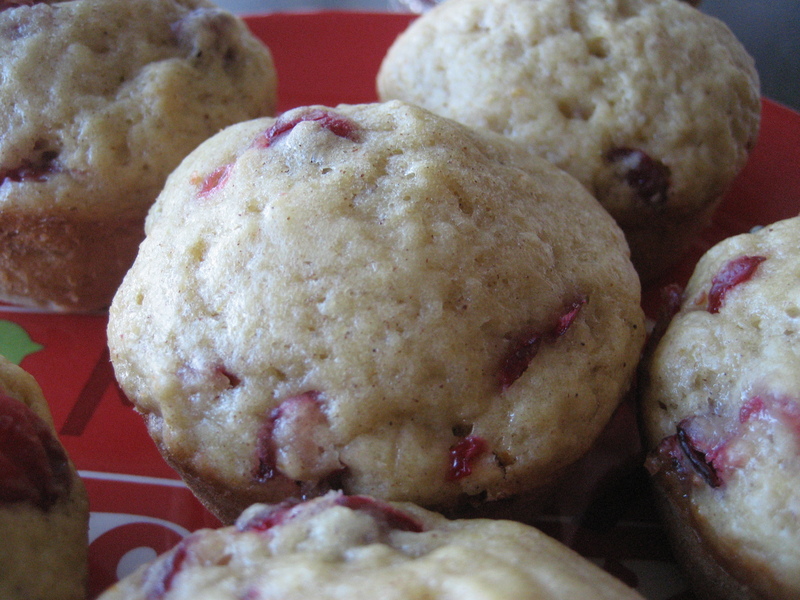 These muffins are in one of my most used cookbooks, Muffin Mania. If you don’t have one, I suggest you try and get your hands on one, it’s the best muffin cookbook around! Coarsely chop cranberries. Sprinkle with 1/4 cup sugar and set aside. Sift together flour, 1/4 cup sugar, baking powder, salt, cinnamon, all spice and make a well in the centre. Combine egg, orange peel, orange juice and melted butter. Add all at once to the flour mixture stirring to moisten. Fold in cranberry mixture. Bake in greased muffin pan at 375 for 15-20 minutes. We hope that you have a wonderful Christmas Day filled with lots of love and good food. Happy Christmas! Could there be a better time of year to start a baking blog than Christmas? We don’t think so and thus here is Bake with Us. The C. Stewarts are baking up a storm and sharing it with you. It is Big C.’s job to make breakfast on Christmas morning and this year the decision was made to cinnamon bun it up. Here is the recipe courtesy of The Complete Canadian Living Cookbook. 2. Turn out onto lightly floured surface; knead for 7-10 minutes or until smooth and elastic, adding enough of the remaining flour as necessary. Place in greased bowl, turning to grease all over. Cover and let rise in warm draft-free place for 1- 1 1/2 hours (or in refrigerator for 8 hours) or until doubled in bulk and impression remains when fingertips are pressed into dough. 3. Filling: Melt 3/4 cup butter with 3/4 cup of the sugar in a saucepan while whisking. Pour into greased 9 x 13 glass baking dish. Melt remaining butter; set aside. Combine remaining sugar and cinnamon; set aside. 4. Punch down dough. Turn out onto lightly floured surface; roll out into 18 x 14 inch rectangle. Brush with all but but 2 tbsp of the melted butter, leaving 1/2 inch border uncovered; sprinkle with sugar mixture. Starting at long side, tightly roll up, pinching seam to seal. Brush with remaining butter. With serrated knife, cut into 15 pieces; place, cut side down, in pan. Cover and let rise for 1 hour or until doubled in bulk. 5. Bake in centre of 375 over for 25-30 minutes (I did 20) or until golden and tops sound hollow when tapped. Let stand in dish for 3 minutes. Drizzle with icing sugar.